It’s clear that the sequester will do plenty of damage to domestic priorities like education, R&D, national parks, regulatory agencies, etc by bringing non-defense discretionary spending down to historic lows. But at least it will begin reducing the debt right away and help put the federal government on a more sustainable fiscal path, right? Unfortunately, no. It turns out that the sequester will likely cause the debt ratio (public debt as a share of GDP) to rise rather than fall in the next couple of years. This is because there is a strong interaction between fiscal policy and the economy when the economy is weak and underperforming (i.e. operating below potential output), which the Congressional Budget Office projects it will be until mid-2017. A weak economy means a higher deficit: a high level of unemployment both depresses tax revenue and forces more people to rely on the social safety net (e.g. unemployment insurance, Medicaid, food assistance, etc). As the economy expands closer to potential output, the deficit falls because people move from the social safety net back into employment, resulting in lower spending and higher revenues. This relationship also works in reverse: fiscal policy choices have a significant impact on the economy when it is operating below potential. Expansionary fiscal policy (i.e. spending increases or tax cuts) injects demand into the economy, causing a boost of economic activity and job creation. Contractionary fiscal policy, such as spending cuts or tax increases, drains demand from the economy and creates a drag on growth. In fact, from 1969 to 2008, each dollar increase in actual GDP relative to potential GDP has been associated with a $0.3768 reduction in budget deficits (Figure A). 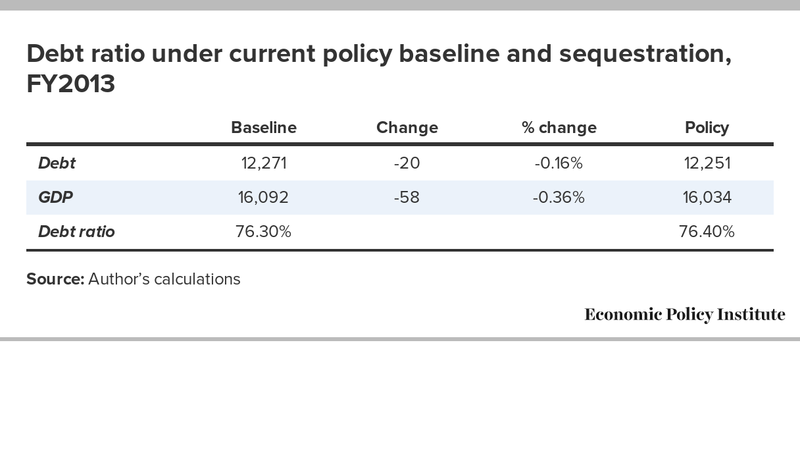 To be slightly more conservative, we use a rule of thumb in which each dollar increase in GDP translates into a 37 cents reduction in the deficit while the economy is below potential. We call this the fiscal clawback ratio. This interaction has huge ramifications for estimating the debt impact of the sequester in the coming year. In fiscal year 2013, the remaining seven months in the fiscal year translates into a $42 billion spending cut. If we assume a 1.4 multiplier, this will cause a $58 billion reduction in GDP (from a starting base of roughly $16,092 billion. But debt itself will only fall by a net $20 billion, off of a starting base of $12,271 billion, because the $42 billion spending cut is offset by a $22 billion deficit increase (the 37 percent clawback ratio applied to the $58 billion GDP impact) stemming from the now-weaker economy (the FY13 debt and GDP bases are calculated by applying current policy adjustments to CBO’s current law projections). Sure enough, the baseline debt ratio for calendar year 2013 is 76.3 percent, and under sequestration it rises to 76.4 percent. This is actually intuitive: a ratio will rise if the denominator falls faster (in percentage terms) than the numerator. In this case, GDP falls by 0.36 percent, while debt falls by only 0.16 percent. The Ryan budget would similarly cause the near-term debt ratio to rise. In fact, the sequestration cuts—which the Ryan budget maintains—represent the entirety of its fiscal impact though fiscal year 2013, so it would have the same impact: the debt ratio would rise by 0.1 percentage points. The Ryan budget schedules most of its spending cuts for fiscal year 2014, leading to an even larger increase in the debt ratio in that year compared to 2013. Why does this matter? Because it is the debt ratio—not debt itself—that is the relevant metric in putting the federal budget on a sustainable path. The size of the economy is a good measure of a country’s ability to handle a debt burden (remember that GDP is roughly equal to national income, making it analogous to a household’s debt-income ratio). In other words, spending cuts like the sequester and the Ryan budget will actually make the country’s debt situation worse until the economy has returned to a healthier state.